In the early 1980s, in the U.K., there was a program called The Quill (which I actually have) that allowed users to make their own text adventure games without a great deal of complex programming. The Quill was, if not the first commercial text-adventure creation program, certainly the best-selling. This of course led to a bunch of one-person start-ups, people selling their own creations from their homes. Most of these games seem to have little interest to collectors due to their extremely simple packaging and humble origins. 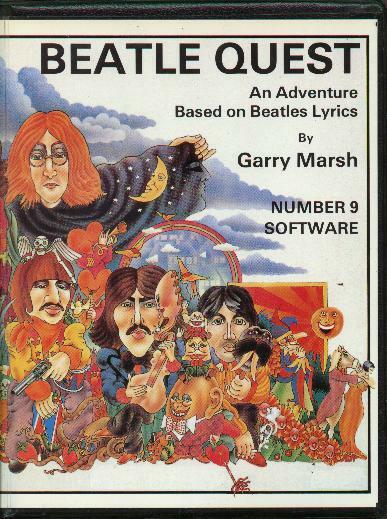 Beatle Quest, though apparently not all that collectible, is still one of the most interesting Quill games out there. For starters, it has far more professional packaging than most Quill games. Rather than using a simple cassette case with a cheaply-printed inlay, Beatle Quest comes in a plastic wallet package similar to the Level 9 adventures, with Alan Aldridge artwork on the glossy inlay. Very professionally done -- the game's story is based on a number of Beatles song lyrics, and the rights to use them are licensed and everything. The game received high praise in British computer magazines at the time. However, it was part one of a never-continued trilogy. I bought up the last of the author's remaining stock a couple of years back, so you probably can't get this anywhere else. Author Garry Marsh has since renamed his company to Number 9 Books, and has published several about the Beatles.